Creatures and Creation, sort of goes together doesnt it ? Humans on the other hand, were created in the divine image, but not as you may at first think. Given the nature to create, and free will choice in how to do this, unlike animals our soul group connection is very separate and the point is to come back to source energy. Animals never leave this vibration, they remain from birth until death an element of their soul group energy. They habituate this planet aligned, and do not seek to become more than which they already are. 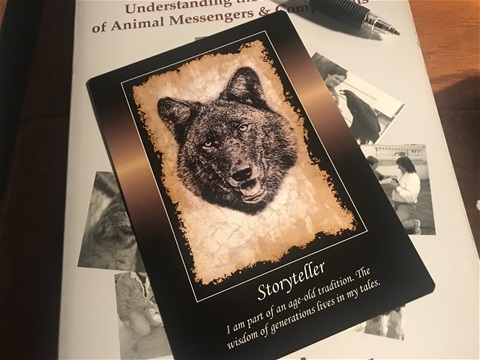 Keanu is inspiring and I have ( as his co-writer and translater) been given to make him a page for inspirations, and a card chosen by himself from the WOLF LIFE PATH CARDS, by Sharon Lynn aka White Elk Woman. Telepathy is how Dr Doolittle spoke to the animals. they didnt make human talk, which is rarely of truth or actual meaning, they are of divine mind and heart, animals cannot lie. I asked him which card, and as I pick up the deck, immediately I see/know which card he chooses and will share along with surmises and incidents from his days and events. Today, in galactic terms, the Dreamspell calendar says it is the day of Solar Worldbridger, and Keanu indicated a card as I lay them out in front of him, choosing most appropriately. 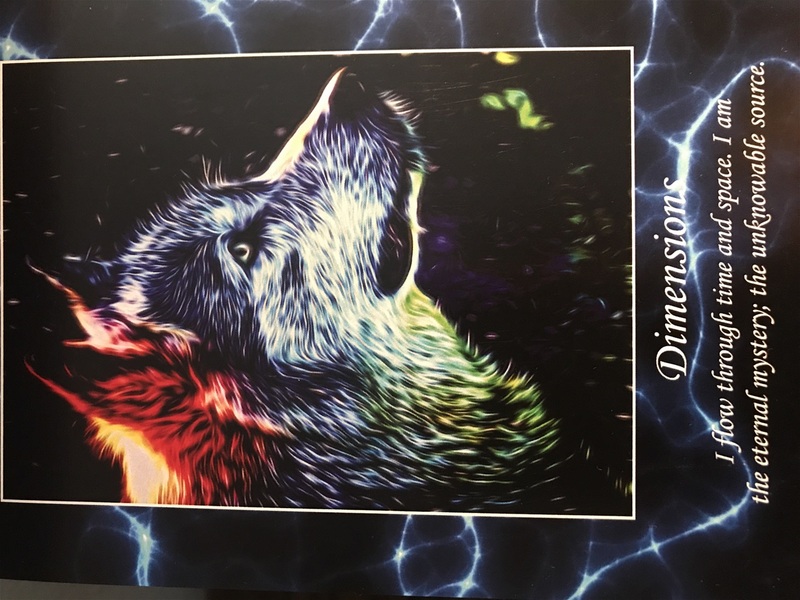 He chose, Dimensions..This card is about activating the 3rd eye and crown for divine in-tervention, guidance and wisdom on many levels, and understanding out of body experiences. 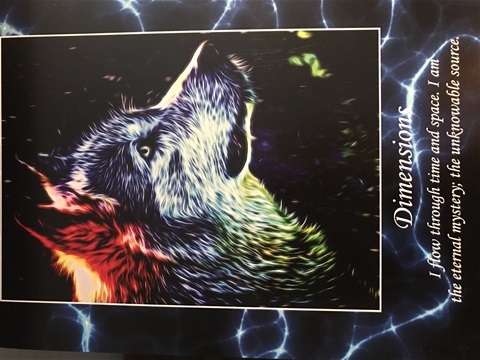 The questions you may ask are: How can I be the best i can in this third dimension? If parallel worlds exist, how would I know? What new information is coming to me? Keanu himself is an enigma, his previous life a mystery to me. He has 3 years between retiring as a racing greyhound and coming to me via the GAP programme. They had no information about his life in those years, just that he was surrenedered. I say, or rather he says, it was time to do this in order to come be with me . Divine timeing and intervention to a tee. The synchronicites are irrefutable, and I wonder should I search and discover or let it alone? He says, he came with no baggage, do not create any and this is certainly so true, so I feel in the end, what is required to be known, will be in divine order and time. Taking a leaf out of my own book of rules, I will allow the universe to reveal, which is always the best way. I can take action and set some intentions, and what then comes I am supposed to know, the rest is over, done and dusted. 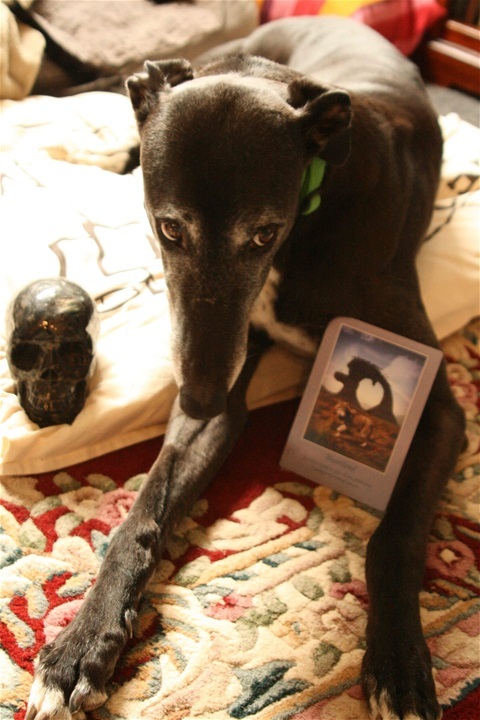 He is an amazing hound, wellbehaved, gentle and lives his life in perfect order, as it should be. Keanu’s Inspiration is of love, which is the Dog way . What needs to go from my past in order for me to move forward? I I turned around, what new perception of life would be there be? Keanu says discovering the beauty in what surrounds you each day is the key to seeing the beauty in yourself and discovering that love which is innate and often seemingly hidden in the mundane. There is beauty in all of life, and taking a walk sometimes opens you to see more than which is visible to the human eye when the heart has not been awakened. The breath of spirit is in the air, and walking the earth allows you to reconnect, as above so below, and without becomes the reflection of within. 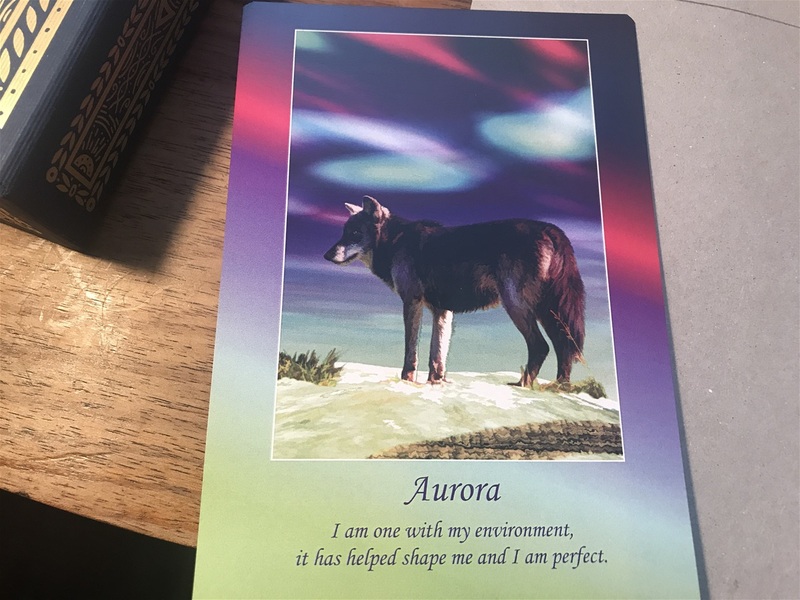 Todays card, chosen Valentines Day, a day to remind us that our environment refelects the feelings we have for ourselves. On this day we may desire or expect expressions of love from another, but what about from myself? How I feel about myself is creating the environment around me and reflecting out to others, and in turn they behave accordingly. The Aurora Card that Keanu has sniffed at and shown as chosen fits perfectly for today, as it says 'I am one with my environment, it has helped shape me and I am perfect". The suggestion is to open and active the third eye for visualizaton of emotional cleansing and healing of past situations. Imagine a beautiful aurora of light shimmering around you, like the Northern and Southern Pole lights and in side this light you are being cleared of outworn unforgiving energies that hamper and deplete, and the light itself is creating an environment in which you can rebuild with love and compassion and ease as a foundation. We forget we have this beautiful imagery around us each day. Our personal Aura, each one of us on Earth has one, is reflected in the poles and their amazing light show. We tend to see only outwardly, forgetting our own beauty just as we yearn for love from another without first giving it to ourselves. Keanu has stepped into his new environment, here with me. He is reminding me there is no need to change for another, only the understanding that as we are all perfect, and our environment begins on the inside and reflects outwardly feelings of contentment, happiness, and joy in the very tiny simple things in an ordinary day begets a micro 'environment' and this is the basis for the healing of the macro, the planetary environment and wellbeing of and for all sentient beings, all that exists is of a sentient nature, there is no other way. Dog is the totem of love, uncondtional and real. A dog shows love or not, it does not pretend, it does not feel it has to be something it is not. It behaves also according to its environment , outward behavior telling us clearly how the inner environment of the dog is feeling. We humans hide all, scared that others will see our inner turmoil. Meditate, envision the Aurora lights around swirling around you, see your own inner light the same swirling through your body alighting the spirit and cleansing the soul within. The human beeing desires and requires a personal optium environment to flourish, but one can only make this for ones self. No one else can provide this. Begin on the inside, and allow it to reveal around you, shown by the environment you are finding yourself in now. Give Gratitude for the insight and work on balancing inner and outer, see what is around you and work on the inner expression to fine tune and you will see the changes. If there is an environment you need to leave, then imagine it disolving and tell yourself you deserve better. Telling yourself this, listening and actually doing something about it, gives the universe permission to assist. Todays card, chosen intuitively and telepathed via dog transmission is 'Storyteller'. I am part of an age-old tradition. The wisdom of generations lives in my tales. From Keanu: The perfect first card, as my tale begins. 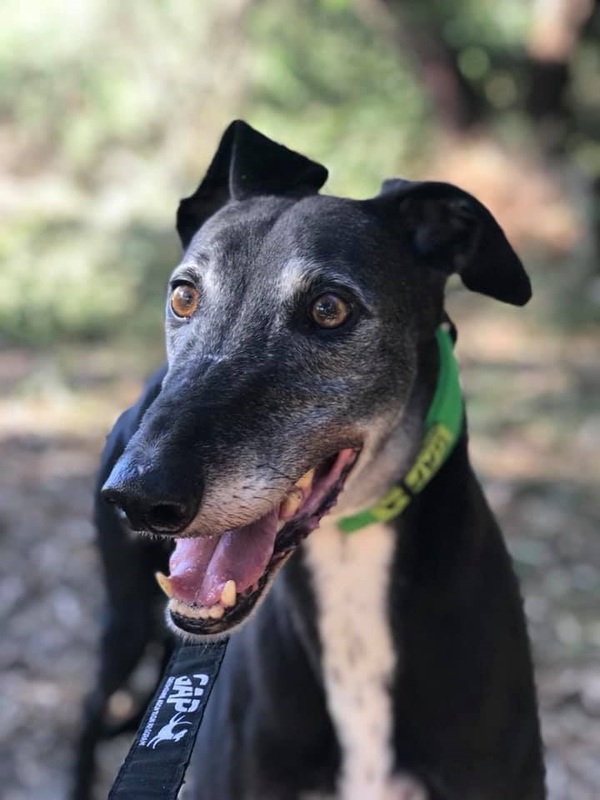 Dogs and wolves have long been referred to in storys and legend for eons, and noted in great historical civilisations, especially Greyhounds, being recognised for the speed and for their heartwarming generous nature. Aesop used animal tales in his fables of metaphor and meaning, and so many popular and well known movies are based on and included animals, especially dogs. Lassie come home is a famous dog story, and I have 'come home' . My own new beginnings corresponds with my new home and my birth code for this year, a big ONE. This card, is the one I chose to show my scribe, for my paws were made for walking, not typing but my intelligent and vigilant mind, is the perfect tool for telepathic commucation and that gives chase for a good story and happy ever after. What is your story human ? Are you communicating with and via your higher mind and tuning into the details of your life. You are the story. I surrenedered my self to a pound in order to get the ball rolling, and its led me here to Crib Point. Surrender human, no matter what you personal circumstance, surrender yourself to the will of the divine, God, which you know is the annagram of Dog, and you will be fine. No choke collar, no tight lead, no dragging, growling or chasing rabbits to avoid your story please. Be the teller and the story, .. Which story should you tell? How best can you share your experience, and Where can I find new stories to learn from? These are the questions on the card, see what they really mean, meditate on them, and your tale shall be told, as you 'allow' it to evolve.